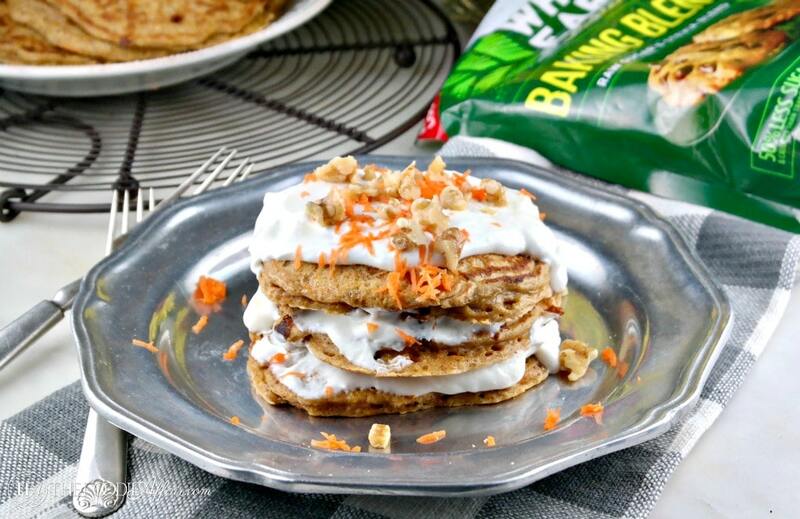 Carrot Cake Protein Pancakes topped with honey yogurt cream cheese! These pancakes are made with a secret ingredient sure to keep you satisfied for hours! Pancakes That Fill You Up! Can you believe that it’s already springtime? The season of blooming flowers, warmer weather, and more daylight! Welcome. Welcome, sunshine! It’s quite comfortable outdoors. Cool enough to need a light jacket just in case you get caught in some sprinkles, but nothing that will keep us indoors much longer. It’s time to take advantage of the lovely weather and lace up those hiking boots or get the bikes tuned-up and start exploring outdoors! When Alan and I spend our time outside we’re gone for 3 or more hours at a time. We always make sure we have water with us, but don’t always bring snacks, so it’s important to eat a good meal that will keep us satisfied for hours. Pancakes don’t always fill us up, especially if it’s topped with a sugary syrup, but these pancakes are made with ingredients that are filling and tasty. These pancakes are made with a mix of oats, whole wheat flour and blended cottage cheese! Have you eaten cottage cheese pancakes before? They’re delicious! Even if you don’t like the taste of cottage cheese, you’ll be pleasantly surprised how tasty these pancakes are! First, the addition of spices added to the batter is so flavorful the cottage cheese flavor becomes undetectable. Also, I lightly sweetened the batter with Whole Earth Sweetener Baking Blend, which is a mix of high quality raw sugar and organic stevia, which add a rich sweetness to the pancakes. In a blender add, flour, oats, sweetener, pumpkin pie spice, baking powder and soda. Pulse until oats turn to a flour consistency. Remove from blender and place in a large bowl. In the same blender add the eggs, cottage cheese and pulse 2-3 times. 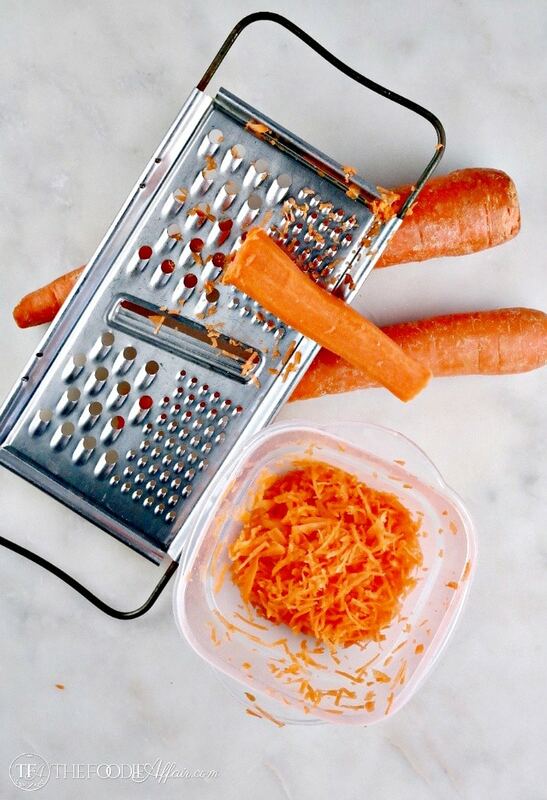 Fold in shredded carrots and let the batter sit for 3-5 minutes. Grease a griddle and turn to 325 degrees. Pour 1/4 cup of batter on griddle (smooth batter with the back of the measuring cup). When bubbles form, turn the pancake and cook for another minute. For yogurt topping, whip together cream cheese, yogurt, sweetener, and milk until smooth. Once the pancakes are cooked top with a yogurt, cream cheese mix with a little sweetener. I used a honey & stevia blend, but any sweetener can be used. 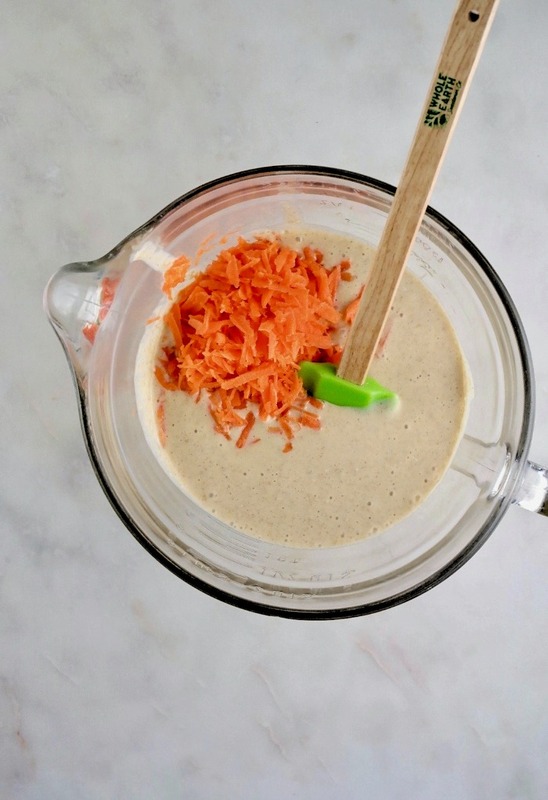 When you add the carrots to the batter, all the flavors meld together deliciously! 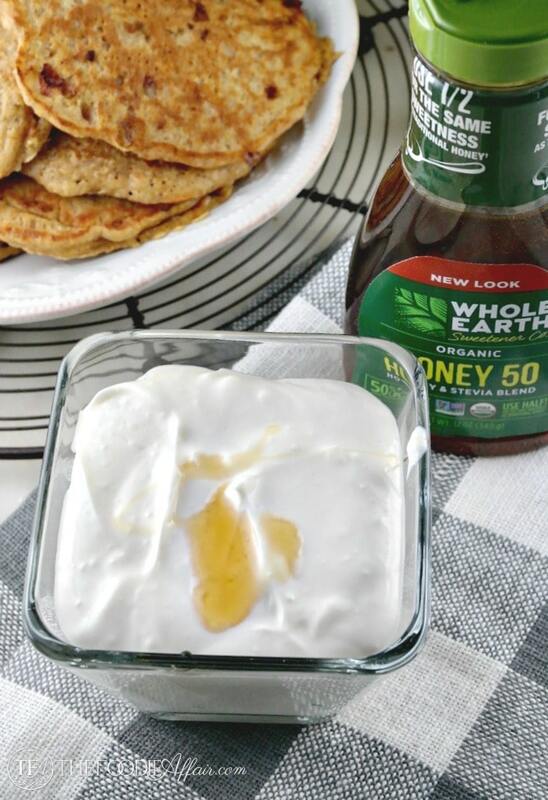 Before heading off to your next outdoor adventure, enjoy a plate of these pancakes topped with honey yogurt! This filling breakfast can be served for brunch or your next holiday gathering as well! Filling and satisfying sugar free pancakes with a delicious yogurt topping. In a small bowl add lemon juice to the milk and set aside. 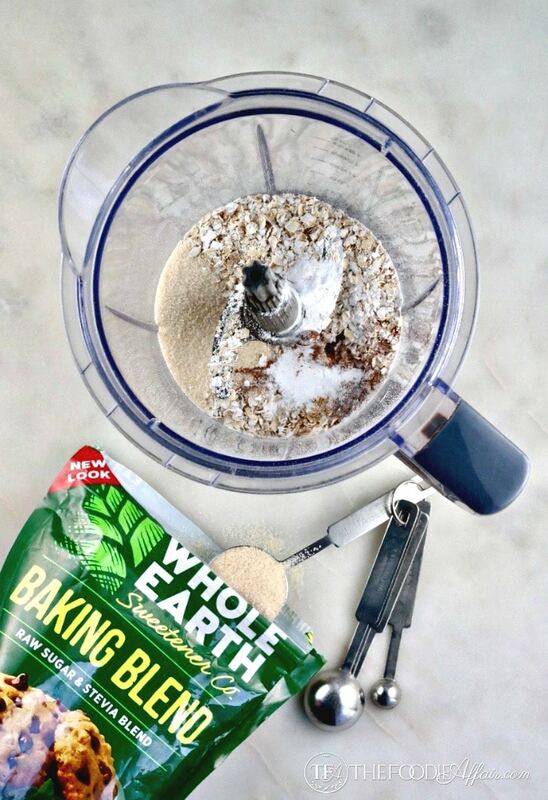 In a blender add, flour, oats, Whole Earth Sweetener Baking Blend, pumpkin pie spice, baking powder and soda. Pulse until oats turn to a flour consistency. Remove and place in a mixing bowl. 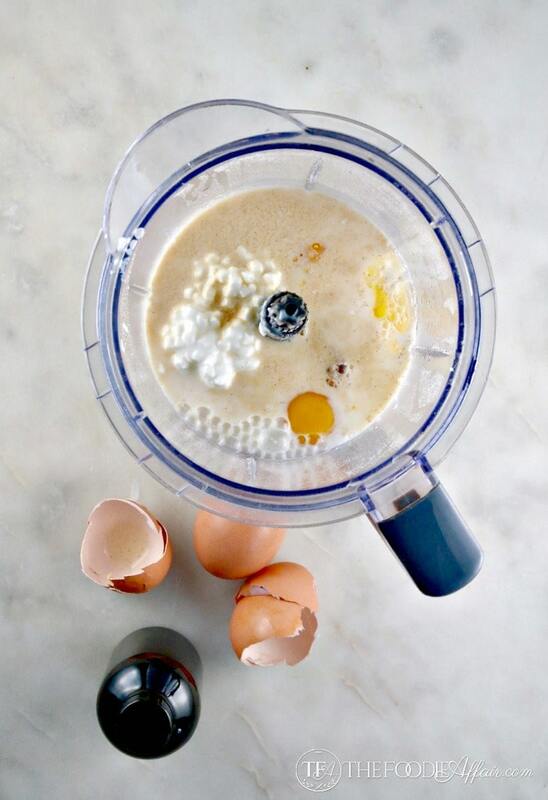 In the same blender add the eggs, cottage cheese and pulse 2-3 times. Add to dry ingredients. Stir in lemon/milk and let the batter sit for 3-5 minutes. Grease a griddle and turn to 325 degrees. Pour 1/4 cup of batter on griddle (smooth batter with the back of the measuring cup). When bubbles form, turn the pancake and cook for another minute. Buttermilk can be substituted for the milk and lemon juice. My husband is the chief pancake maker around here, so I’m going to have to give him this recipe to try. This sounds like it’s right up his alley! 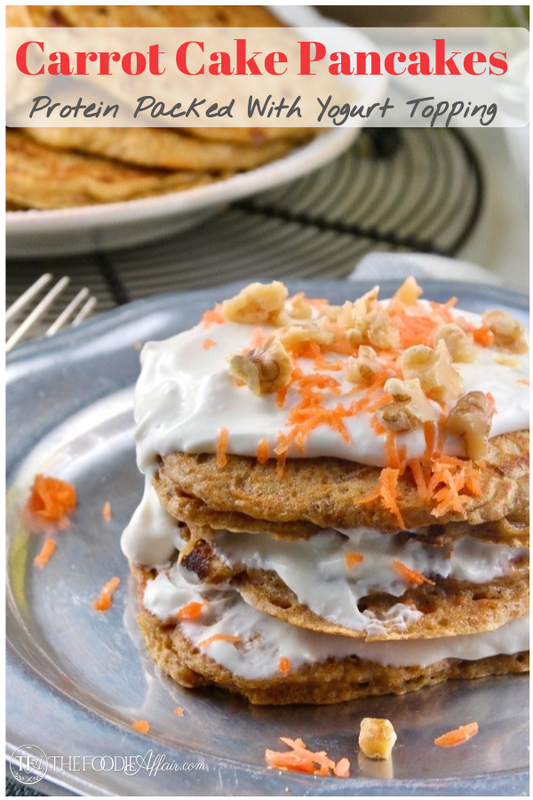 Yes, I hope he’ll whip up a batch of these carrot cake pancakes. It’s delicious and it will keep your kids full for several hours too! What a fun idea Sandra! 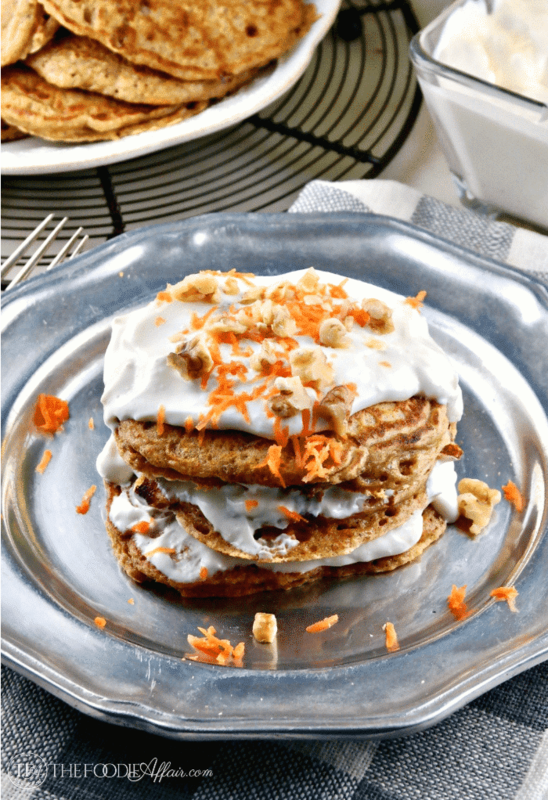 Carrot cake but in a healthier pancake form. These look hearty and delicious. Thank you, Bobbie! I’ve been eating these all week. They’re delicious and since it is made with less sugar I’m not hungry for hours! What a clever idea! 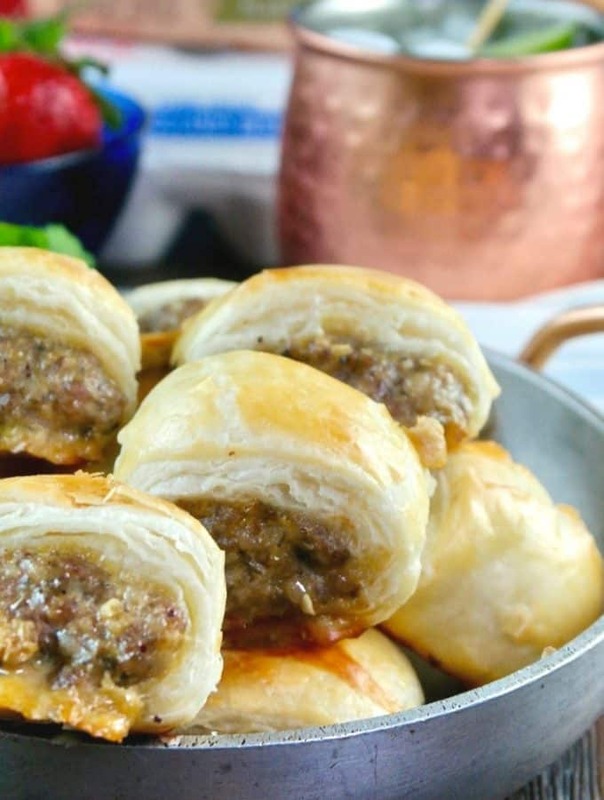 I certainly need to try this recipe this weekend! YUM!!! These will freeze too, so you can pop them in the oven anytime! These pancakes look so delicious! They would be perfect for any brunch! I love the idea of starting the day with a healthy yet delicious breakfast that’s full of flavor! Yum! You’ll want to savor every delicious bite, Debi! I will be giving these a try most definitely! I love that these aren’t loaded with sugar. These look so delicious, perfect way to start the day!! I feel the same way about excess sugar. We certainly won’t miss it if we cut down on the sweetener. We love pancakes but I always hate that they are so full of sugar. Getting in some veggies and protein with these is just what we need around here! Yum!! It’s hard to send your kids off to start they’re day with a sugar loaded meal. The whole family will love these pancakes! These look SO good!! I love the carrots in these. Such a great way to get kids to eat their veggies! 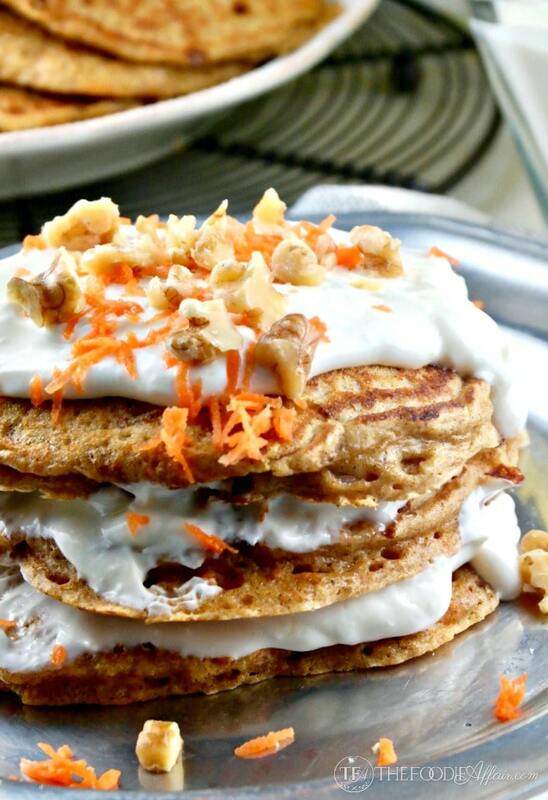 Carrots taste great in pancakes and they’re so good for all of us! This looks like one delicious pancake. We don’t always think to take snacks when we head out for outdoor activities. This would be a great way to start the day. My hubby and I are starting to do some hiking in preparation for our move to Arizona. Lots of hiking there and I always forget to hydrate. I also now know the importance of having a protein rich breakfast to keep my going on the mountain! These are amazing and will be perfect before our next hike! What a fantastic recipe!! I ADORE carrot cake, I know I would flip over these! What an awesome breakfast idea! 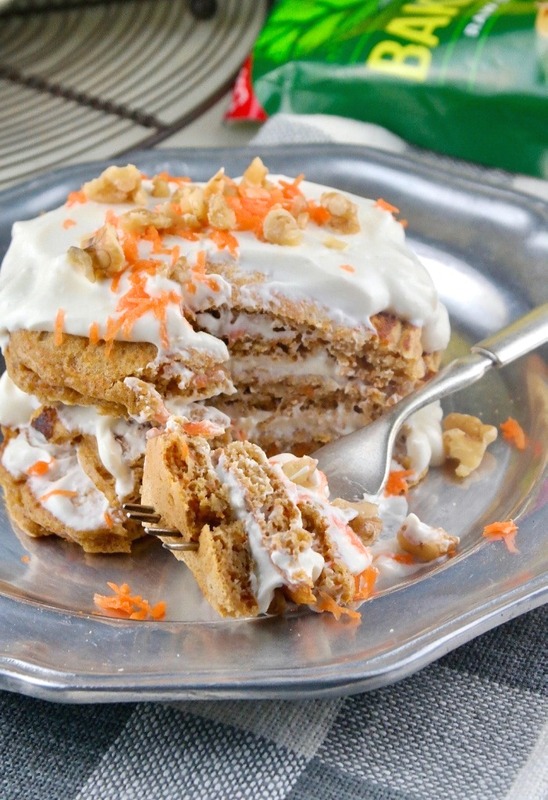 I love carrot cake and this is such an awesome spin! These pancakes would keep me full all day long with energy to burn. These pancakes are loaded with protein and fiber and I love your tip that they freeze well! These look like dessert for breakfast!!! LOVE IT! And healthy too! Im not a syrup lover so Im especially happy with the sweetened yogurt as a topping! I cant wait to try the cottage cheese in the pancakes… love how there will be some good protein in my breakfast! This was the best breakfast for dinner we have had in a long time! 5 stars!! Thank you! Brinner for the win! Thanks so much for the review!